With a Russian/Dutch heart: Oh luxury! I can tap water again! Oh luxury! I can tap water again! Today is my friend Edna is having her birthday, so from here I wish you a Happy Birthday and that you will have an awesome day! The weather here is quiet, not bad at all, last few days we had temperature around 10C, it might creep up this week a bit to 13-14C. We have sunshine with some clouds, not much wind, so I am not disappointed about this weather. You know i had trouble with the tap at the sink in the kitchen. Well, Monday morning I called my plumber and he was so nice to come that very same day. He fixed the tap(he put in a new one), without having to remove the sink, he could reach the tap with some gymnastic movements LOL. At the same time he cleaned the central heating kettle, so all was done on the same day and for a very nice price. It was a lot cheaper as I thought it would be. I am sooo happy with the new tap, with this one it is als easier to put a bucket under it than with the old one. I believe that also Jan was happy with the fact, that our plumber did the job, bought the new tap etc. The rest of the week was quiet, filled with all kind of little jobs done in the house, nothing really exciting, but I had enough excitement with the tap not working last week and all the commotion, so for me it was more than okay. I didn;t do much work at the computer, I hope will have more inspiration this week to finish a kit and then slowly to start with some Christmas themed ones. I should make at least 2. I must say I am a bit lazy this year with designing, perhaps it has somewhat to do withthe trouble we had end of last year and also start of this one, I don;t really know. Also it might have to do with the fact that my laptop is so very slow, I hope it will hold on for about another 6 months or so, by then we will be in a slightly better financial position (having state pension and a small supplementary pension, no more social security stuff, that will be giving a lot of peace of mind, I hope) and I could buy me a new one, or good second hand one. But.... we must wait for that still about 6 months, because at the moment state pension isn't anymore at 65 years but in our case 66 + 4 months. (We sould have been born one or two years earlier, then we still would have had the old regulation of 65 years. Yes, the government in all its wisdon(hahaha) decided some years ago that start of year of pension should be at a higher age. we are still kind of lucky, because it is now at 67 years. This week i think I should make some time for wrapping up Christmas presents, that I have to send away in a package. I want to send it early, because last year it took an terrible long time to arrive at destination, so I want to bring it to the post office around perhaps the 3rd week of November. Better it arrives may be one or two weeks before Christmas than too late again. Must take a look in the kitchen, because I have a stew on the stove bubbling. Just a minute.......................okay, that is ready. Easy cooking that is, now I only have to boil a couple of potatoes to go with that and done. When i finished this post I want to make a small pan with stew pears, it is the season again for them and I love to have them as dessert. 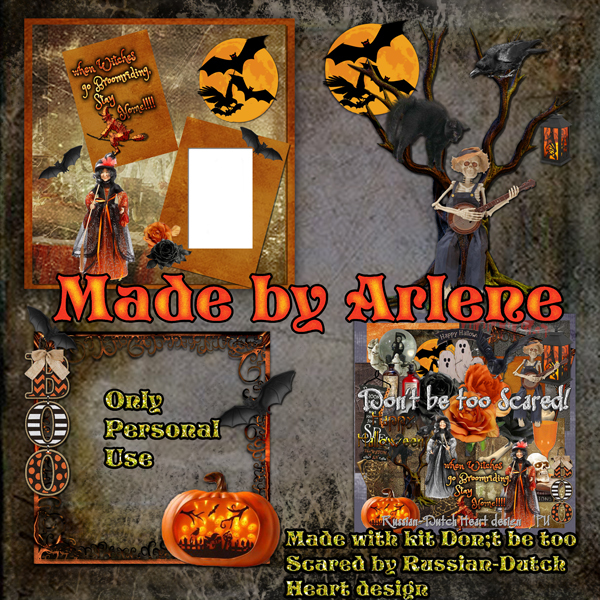 Today I have for you some fantastic clusters made by Arlene, made with the Halloween kit of last week. I'm so glad your tap is fixed. It sure does make life easier when it is working right. I love the clusters from Arlene, especially the one with the skeleton leaning against the tree. Thank you. I'm in a hurry today because I have to get dressed. The kids are picking me up in a little while. But I wanted to say thank you and hope that you and Jan have a wonderful week. Big hugs to you, Edna B. Thanks for the newer kit.